Last time not worn: 1979, retired as soon as Brock took off the jersey. Everyone knows about the stolen base totals and how Bing Devine orchestrated probably the greatest theft in the history of the game. While I’m too young to remember that final campaign, I can hear the ovations now that Brock deserved then and still gets now with every appearance. We are officially t-minus 20 days and counting until the return of America’s Pastime, and that can mean only one thing at the Conclave. First and probably more accurately, second since that is where Brock typically ended up — we have to take a moment and thank the Cubs for shipping The Franchise over just in the nick of time. You see, the Cardinals needed just the right fit in 1964 to put that club over the top and were also trying to do the impossible at the same time. A stadium-size hole needed to be filled in Left Field after The Man tipped his cap for the final time and honestly, there wasn’t anyone in St. Louis who could even attempt it. That’s where Chicago enters the equation and the rest is in the history books. That first summer the green light was ablaze, and Brock wasted no time. Acquired in June from the baby bears, #20 celebrated his first start wearing Red with a steal and then on his birthday had another. He finished with 33 in 103 games, only seven fewer than the rest of the club and never looked back right into October. 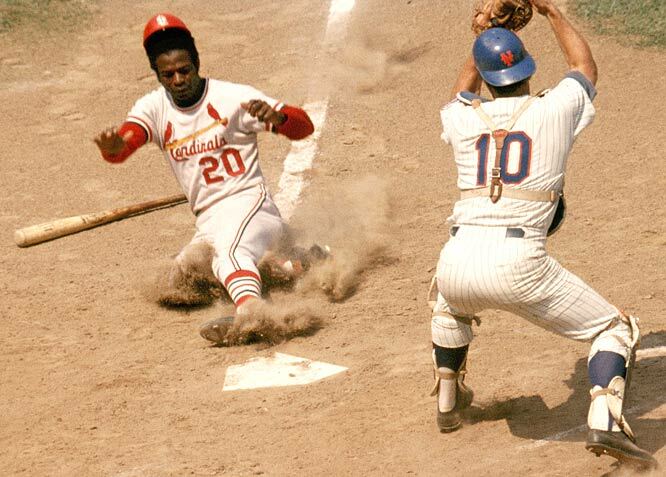 The Cardinals won it all that year and returned in 1967, one of Brock’s finest of his illustrious career. I really did attempt to pick just one season as his best, but I encourage you to just look at how impressive the overall body of work was right up to 1979. Brock’s greatest achievement, however, wasn’t finishing as the career steals leader or his 3,000 hit. Those may have made the first ballot Hall of Fame a given, but I’m more interested in a certain seven game series against the Red Sox that started October 4th. I included the link because it still gives me chills every time I see it and not because Gibby was about to announce his presence with that patented stare. Boston could not retire Brock that day or keep him from swiping second or scoring the go-ahead winning run. I’m only left to wonder why they couldn’t have awarded co-MVP’s that series since Brock was just as masterful. Fast-forward 12 months and how do you think the Cubs felt seeing flashbacks as Brock was putting up even more impressive World Series figures against Detroit. One of the best moments of my life was getting to witness an Opening Day ceremony in St. Louis where words are just lacking but no one ever looks happier than the man who stole our hearts.